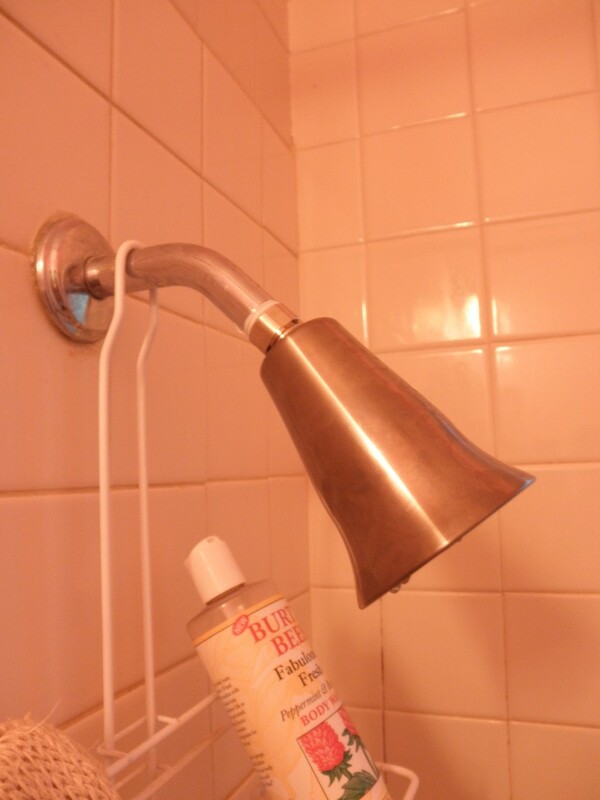 Most of you probably know that one of the best ways to save water in your home is to switch to a low-flow showerhead. I’ve been using a handheld low-flow for the past year, but I had the opportunity to test Delta’s new Transitional Low-Flow Showerhead recently. Delta claims that their showerheads only put out 1.5 gallons per minute. I tested that with a bag I got from It’s Easy Being Green. This bag measures your shower’s output so you can easily tell how many gallons it puts out per minute. I love this thing. Anyway, Delta is not lying; the showerhead does put out 1.5 gallons per minute. But that’s on full blast. I turned down the flow to the level I normally shower at. At lower pressure, it’s putting out just under one gallon per minute. Now, nothing on the showerhead adjusts the flow. This is Delta’s most basic low-flow showerhead, so it doesn’t have the bells and whistles the other heads do. To turn down the flow, you have to turn down the hot or cold water. 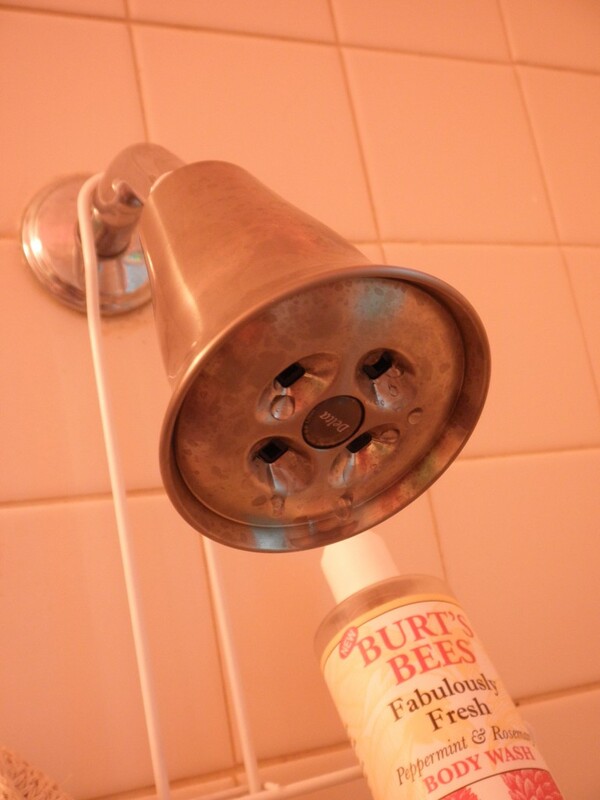 But I was doing this already with my other showerhead, so to me this is no big deal. The water coming out of the showerhead was gentle. It didn’t feel like needles hitting your back, but more like a pleasant steady rain. Even with the lower pressure, I still got plenty clean. Which just goes to show you do NOT need a showerhead that feels like a firehose in order to wash off. The showerhead was a cinch to install (well, a cinch for me since Andrew did all the work…but it didn’t LOOK hard). It’s also much more attractive looking than the low-flow showerhead I WAS using. Basically, it just screwed right in. Now, there is a downside, not to the showerhead itself, but because of my old bathroom. Apparently, hobbits built my 1910 house. This showerhead comes down fairly low, much lower than my old one. Which means my husband had to crouch down to get under it. I mean, really crouch. After a few days, we had to take the Delta showerhead off. It was just too uncomfortable for him. But again, this is only because my particular shower output is so low. I’d imagine 90% of homes (with normal-height showers) can use this showerhead just fine. This particular Delta showerhead, the Transitional Low-Flow Showerhead, sells for $59.70 on their website. The showerhead I WAS using was from Earth Massage which sells for $29.99. I like the convenience of that one because it’s great for washing the dogs. But I liked the spray of this one better. It was softer, and it dispersed the water better than my old showerhead. This particular Delta low-flow showerhead comes in four finishes, all all range in price. The most expensive is the pewter, which sells for a tidy $147. Final vote? I give it a thumbs up. If you’re looking for ways to save water in your home, the Delta Transitional Faucet is a great option. Well, wow that was a fancy review. How does it compare to the other low flow showerheads out there? Are there others? Prices? What colors do they come in? Are there other shapes/styles? Is the flow adjustable? If so, by what mechanism? Does it auto-reset to the lowest flow if someone does turn it up? How does it work? Does it narrow the stream and give you more pressure? More air? (hint, the more air will give a short person a very cold shower requiring them to increase the temperature of the water which may not be a net negative but is still an unpleasant experience). I’m sorry this may come off as a bit harsh but I got less than no information from your review. I’ve just spent three years re-doing three bathrooms for a large home with renters and owners living in it. We went with a Delta system in two of the bathrooms. Low flow heads but those are for the guys of the house as I mentioned earlier the women find the Delta to get cold as their mechanism for lowering the flow is to add a bit of air. The pressure is good but does NOT feel like the old fashioned “needles hitting your back”. It feels like full drops of water and no one complains of cleanliness or lack of pressure. The last bathroom we went with an American Standard (forget their fancy name for their low flow one) but it’s physically larger than the Delta ones, priced a bit more but is adjustable on the showerhead itself for anywhere from 3.0 gpm to 1.4 gpm but it auto resets to the 1.4gpm as soon as you turn off the water. The water pressure itself will hold it open at the higher flow rate only as long as that person is in the shower. There were some huge psychological issues to overcome with moving renters to the low flow options and JUST GIVING them the option of higher flow meant that, in a retrospective asking of the renters, they used it once and then forgot about it by the next time they showered and it was a great shower. Of the people that have used both the Delta shower and the American Standard shower there is a slight preference for the “feel” of the American Standard low flow version. But that is a very small sample size (under 10) and very unscientific. The age range is between 20 and 65, a mix of women and men. The reasoning behind our choices: we went with the Delta ones in two baths as that was the only option that fit well with the rest of the detla faucets and plumbing we’d choosen (they have very good warranties) the third bathroom was a retrofit and nothing worked so it was a lot of cobbling together of different pieces and the option for the American Standard one opened up. I’d recommend that one over the Delta one if you’re doing anything in brass, have women in your house, and/or are trying to overcome a psychological barrier to the adjustment. Otherwise the Delta ones we’re fairly happy with. You know, you’re right. I did write this when I was a huge hurry this morning, and it wasn’t as comprehensive as it could have been. I’m really sorry; it’s not in my habit to put out content that incomplete, and it’s certainly not a habit I want to get into. I’m expanding on the review now, and I appreciate you speaking up! Um… I’d like to know the chemical composition of the metal, whether or not the showerhead is affected by UV Radiation, radon gas or aliens, and where I can sign up to get one to test as well. And I don’t get the Internet, so if you could please respond using smoke signals, my wife (who as you know is an Indian) will translate. Try a shower arm extension – Amazon sells them and I’ve seen them at Lowe’s too. I’m really short and have lived in places where the shower head was too low even for me, got one of those and it works great, easy to install and take off. A couple mo. back we switched to low flow fixtures, faucets, and toilets and have seen a significant decrease in our h20 consumption and cost. We anticipate make up the intial expense with in a couple months. I live in an apartment, so I had no choice but to accept this low-flow showerhead. I HATE it. To have a warm shower, I have to turn the hot water on full and the cold on just a touch, so when I’m finished showering, I have to make sure to turn off the water first or I burn my feet. I also have waist-length curly hair. With this showerhead, it takes over 20 minutes to rinse the shampoo out and another 30 minutes to rinse the conditioner out. I don’t have an hour to spend doing this in the mornings. And there can’t be any water savings with this.